One of the most specialized and newest aspects of ultrasound technology is contrast-enhanced ultrasound imaging, or CEUS ultrasound. Although this technology is relatively new, the potential applications are exciting and could be greatly expanded in time. 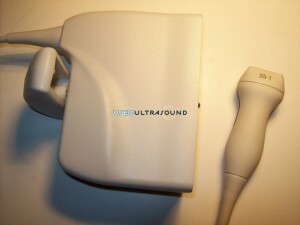 For now, there is only a limited selection of used contrast ultrasound probes and transducers available, but you can find them for less at UsedUltrasound.com. We can also save you money on your ultrasound repair costs with one of our customizable ultrasound service contracts. Our team of dedicated ultrasound experts will work with you to design a plan that fits your particular needs and budget, all while saving you time, money and the headaches that come with downtime created by poorly maintained ultrasound equipment. Contact us right now for more information about ultrasound repair or used contract ultrasound equipment. The price of new CEUS probes can be cost prohibitive for many, and that’s why so many medical professionals trust UsedUltrasound.com to deliver the equipment they need at an affordable price. We carry a complete inventory of quality used ultrasound machines, probes and transducers, including hard to find used CEUS ultrasound probes for sale. Whether you need untargeted CEUS ultrasound equipment or targeted CEUS ultrasound equipment, we can help you save money on the best quality probes, transducers and systems. If you are looking for used CEUS ultrasound equipment or need compatible CEUS ultrasound probes or transducers, just give us a call or fill out our simple contact form and we’ll go to work to find exactly what you need. With our connections and experience in the ultrasound industry we have the ability to locate just about any piece of used ultrasound equipment, and we can do it for less so we can pass those savings on to you. Contact us today so that we can help you acquire the refurbished contract-enhanced ultrasound equipment you need.